I use R a lot in my day to day workflow, particularly for manipulating raw data files into a format that can be used for analysis. This is often a brain-taxing exercise and, sometimes, it would be totally quicker to do it in Excel. But I like to make sure that my manipulations are reproducible. 1. This helps me remember what I actually did and 2. it is hugely helpful when the raw data changes for some reason (new data are added, corrections are made, …) as I can simply rerun the code. One of the things I battled with a few nights ago was randomly deleting duplicate records from a dataframe without using some horrendous for loop. 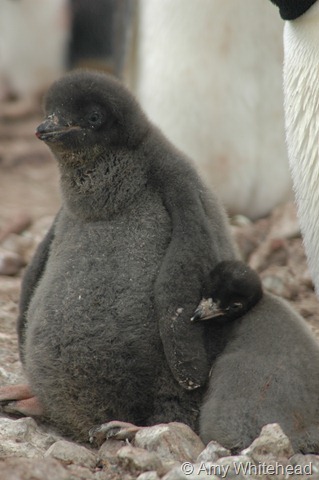 I’m working on a dataset of Adélie penguin chick weights where we’ve measured approximately 50 chicks selected randomly at three sites once a week for the past 16 years. That’s a lot of data. But some of the chicks come from the same nest, so those data points aren’t really independent. Two chicks from the same nest – clearly somebody has been eating all the pies! I wanted to randomly remove one chick from nests where there were two. The data look something like the data below, with nests labelled with a unique identifier and chicks within each nest labelled sequentially (a or b) in the order they were measured. I’ve used the duplicated function before to remove duplicate rows but it always retains the first record. While this is appropriate in some cases, it’s possible that we have a bias towards weighing larger or smaller chicks first, so I wanted to remove rows randomly. But I kept getting stuck with using a for loop, which isn’t very efficient. So I googled “How to randomly delete rows in R”, because this is my strategy for figuring this out in R, and I found an answer on this forum. The function duplicated.random does exactly what I wanted, so I’m reproducing it here so that I can find it again. Thanks to Magnus Torfason-2 for providing the solution (I wish I was this clever). This function returns a logical vector, the elements of which are FALSE, unless there are duplicated values in x, in which case all but one elements are TRUE (for each set of duplicates). The only difference between this function and the duplicated() function is that rather than always returning FALSE for the first instance of a duplicated value, the choice of instance is random. I applied this function to my nest dataset to give me a logical column indicating which chick was randomly selected for the analysis. In this case, I retain all the chicks labelled false as they either were the only chick in the nest or they have been randomly selected by the function. The chicks labelled true are the chicks that weren’t selected for analysis. Slightly counter-intuitive. But then it’s an easy step to filter out the data that I want to keep and run the analyses. You can see that there is now only one record per nest and, where there were two chicks, the selected chicks include a random smattering of both a and b. This seems like a useful function for all sorts of situations. On a slight geekery aside, this is the first blog post that I’ve written using RMarkdown and knitr in Rstudio. I’m liking it. I still need to iron out some kinks in the process but expect to be bored silly with more R-oriented blog posts in the future. To leave a comment for the author, please follow the link and comment on their blog: Amy Whitehead's Research » R.